Need Help Selecting a color? Contact Joycelyn Armstrong for Interior Design Services. Click Here to visit her website. Need Help Selling your home? Or seeking a new home? 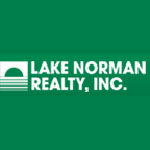 Contact Lake Norman Realty. Click Here to visit their website.